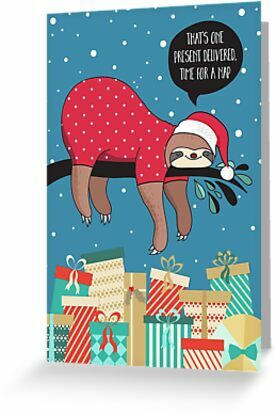 This is a fun Christmas card featuring an illustrated smiling, sleepy sloth wearing a santa hat and red with white stars outfit. The sloth is lying comfortably over a tree branch with a speech bubble above which reads; “That’s one present delivered, time for a nap”. Beneath the sloth are a pile of illustrated wrapped presents in green, red, cream and gold with various bows and ribbons. The background is blue with randomly placed and sized white dots to look like falling snow.